Before you pull the RV up and start looking for a place to pitch the kids tent, I should let you know the camping area is long gone – over 40 years gone. If you’re reading this, chances are you’ve been on the Waupaca Chain o'Lakes and heard someone mention the Camp or maybe you've driven by the entrance sign. 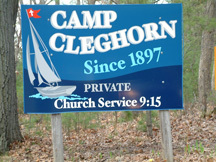 Camp Cleghorn is an association of 41 cottage owners located on the south-east corner of Columbia lake. The camp was founded in 1897 as a summer camp with the mission of educating Campers on the virtues of temperance and persuading them to forswear “demon” rum and all other alcoholic beverages. Of course if you want people to listen to you, it helps to offer something nice in return – or so I’m told by the time-share sales guys. And what’s nicer or more picturesque than staying on the Chain o’Lakes, which back in the 1800’s was known as the “Killarneys of America.” If you’re curious about the journey from temperance camp to current association, click About Us for the short version. For the true history buff - click Cleghorn History. A major part of the camp’s heritage is the chapel. The temperance message was both preached and orated at one of the first buildings erected on camp grounds. Summer worship services are offered 9:15 Sunday mornings throughout the summer. Come attend our non-denominational services held in the historic 100-year-old Cleghorn Chapel. Click for here for information and dates. If you are vacationing in the area and don’t have a church home, we invite you to join us. If you have some bits of history to add to the camps collection or you are looking for someone you met at Camp years ago feel free to Contact Us.